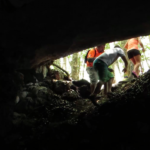 Feeling a little adventurous on your next vacation to Playa Del Carmen? Good! You have come to right place. 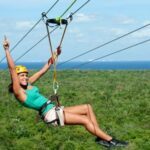 We offer one of the largest selections of Playa Del Carmen adventure tours available on the internet. Our mission is to help you lose yourself from your normal routine, and live out the Indiana Jones lifestyle that you have always dreamed of. Playa Del Carmen is located in the heart of the adventure mecca that is Quintanaroo, and the Yucatan Peninsula. 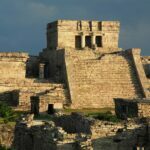 There is so much to do here that you will either have to pack up and move down, or take multiple trips to this part of Mexico to satisfy your exploratory urges. There are literally hundreds of cenotes within a short drive. 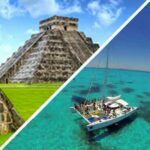 We offer discounted Mayan ruins tours such as Chichen Itza tours, Tulum tours, Coba tours, and a lot more. You may choose to go zip lining, literally swimming with sharks, or the not so threatening whale sharks. Don´t worry they don´t eat people, so far anyway. But hey, if you want adventure who are we to stand in your way. 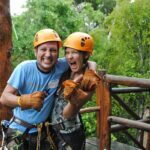 We love adventure so much that we literally brought our company here and decided to spend our time making some of our favorite adventure tours in Playa Del Carmen available for your enjoyment. 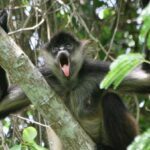 We have decided to trim through the fat so to speak and offer the best tour options that we have personally experienced or heard so much about. So what will you do with your time here? Is it time to get dive certified? We can make that happen for you in 2-3 days time, and have you out on the open water living out your dream. Once you are certified you will have advanced diving options to choose from for the rest of your life. How would you like to dive deep into one of the largest cenotes in the world? If that is your idea of adventure than do something about it. Life is always more interesting when you are looking forward the next new experience. One of our favorite adventure tours from Playa Del Carmen is the Isla Mujeres Catamaran tour. This tour is an amazing experience from start to finish. 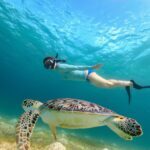 It involves snorkeling at one of the most beautiful protected reefs right off the coast of Isla Mujeres where you will see everything from Barracudas, to starfish, and tons of reef fish everywhere. One of the highlights of the trip however is being taken up to 20 meters high in the spinnaker off the back of the boat. The spinnaker is one of the sails used to propel the sailboat through the water at high speed, however it makes for an exhilarating ride when you fly high above the water hanging from it. Finish this tour out with a gourmet mexican buffet, and an open bar to get some of your energy back and you are good to go. Trust us on this one! Reality is, everyone´s idea of an adventure tour is different and we want you to choose the ones that are right for you! 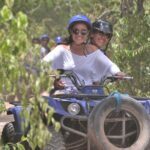 Take your time and look around at the different Playa Del Carmen adventure tour options that we have available for you. We will not steer you wrong with anything that you will find here. We hope that you have the best time possible while on vacation in Mexico, and would like to think that we might be a part of it. Enjoy! 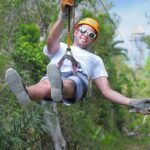 Please note that all of our Playa Del Carmen adventure tours are discounted and presented to you at wholesale pricing. You will not find lower prices at local tour and travel desks at your hotel or anywhere else locally. We offer the lowest pricing possible so you don´t need to shop around. Everything that you need can be found right here on this site.